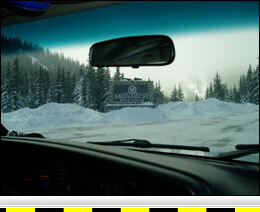 Monarch Pass is a high mountain pass in the Colorado Rockies along the Continental Divide. 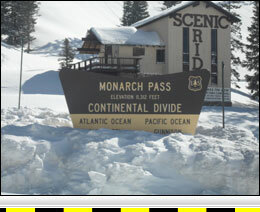 Monarch Summit is located on U.S. Highway 50, approximately 17 miles west of Ponca Springs, Colorado. U.S. Highway 50 is the southern route across the state of Colorado and connects with I-70 about 20 miles east of Utah. U.S. Highway 50, on both sides of Monarch Summit is a classic steep, windy, mountain shelf road. 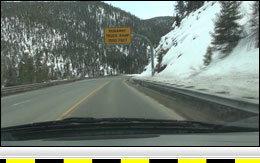 Monarch Pass receives a large amount of snow in the winter and often either has chain restrictions for commercial trucks or is closed for avalanche control. Westbound U.S. 50 from the Monarch Summit has a vertical descent of 2,649 feet over a distance of 8.7 miles. The reported grade for the westbound descent is 6% for 9 miles. The westbound descent is steady over the 8.7 miles before flattening to a gradual descent for a few more miles. The descent has numerous marked advisory curves, the lowest having advisory speeds of 30 mph. At 2.9 miles west of the summit there is a sharp curve hidden behind a rock wall. This curve has a 35-mph advisory speed, however, the curve sign is not visible until you are into the curve. The road at this location is covered with skid marks from trucks, so be careful! A highway department maintenance facility is about 9 miles west of the summit where highway maintenance trucks entering or leaving the driveway should be expected. Approximately 10 miles west of the summit, there is a town with a gas station and other businesses, so traffic should be expected here also. 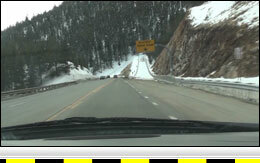 Eastbound U.S. 50 from the Monarch Summit has a vertical descent of 3,009 feet over a distance of 10.4 miles. The grade is reported to be 6% over 10 miles. The descent is stepped with grades varying from very steep to moderate. Although, the descent is windy, it is not as extreme as the westbound descent. There are numerous marked advisory curves on the descent, the lowest being two 35 mph curves a short distance from the summit. The grade bottoms out at 10.4 miles, where there is a slight upgrade before lessening to a mild descent into Ponca Springs. At Ponca Springs, there is a highway junction requiring a stop at about 17 miles east of the summit, and an elevation of 7,437 feet. On the eastbound descent from Monarch Summit, there is a ski area on the left side of the road 1.6 miles from the summit. Traffic will be encountered here, particularly in the morning and afternoon during the ski season. Additionally, at about 5 miles east of the summit, there is a business area with parking lot entrances on both sides of the highway and traffic should be expected here. Lastly, a highway department maintenance facility is about 10 miles east of the summit where highway maintenance trucks entering or leaving the driveway should be expected.